Element was formed in 2004 and after the self-release of a four track EP in 2005, they were signed to the French label Thundering Records. The first offspring of this new cooperation is their full-length album Nos Corps Perdus. 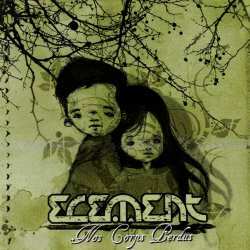 Element play contemporary metal by combining different genres like nu metal, metalcore and industrial. They consider French nu metal band Watcha as their main influence, but give their style a more brutal touch by inspiring themselves by heavier bands like In Flames and Soilwork. French lyrics take care to set them apart from the aforementioned artists. and Laisse-Moi, are too moderate for my taste and could even please fans of French rock band Matmatah. The final song A Jamais Eteint is even slower, but this doesn’t disturb because of its dreamful atmosphere. Element have found a balance of musical ingredients that makes it hard to compare them to one specific band. They sound however rather trendy and probably aim at an audience which is barely out of its teenage years. Element aren’t doing a too bad job on their debut album, even if the commercial touch could sometimes be a little less prominent.